SERDANG, July 27 – Universiti Putra Malaysia (UPM) researchers have successfully produced Biomass Microwave Carbonizer (BMC), an innovation that offers an environmental friendly production of biochar, that produces high quality biochar and doubles the production capacity to over 20 percent within a very short time period of between one and two hours. BMC offers a clean and innovative technology that utilises pyrolysis with the help of microwave technology to burn agricultural wastes or biomass to produce green charcoal known as bio-charcoal. Incineration is at least 50 percent faster than conventional pyrolysis, saving over 50 percent of energy with less than 70 percent carbon release. The process of making biochar or 'instant charcoal' through BMC is totally different from the traditional or conventional process which is time-consuming and involves high smoke emission. The head of the research group, Prof. Dr. Azni Idris from the Department of Chemical Engineering and Environment, Faculty of Engineering, said BMC provides an innovative solution in managing excessive agricultural wastes and biomass by converting them into a better quality product in a short period of time. Among the biomass used are the empty fruit bunches from oil palm that can be easily obtained as the palm oil industry in this country produces 7 million tonnes of empty bunches per year, kenaf, bamboo, paddy, wood chips and coconut shells. "The method used is pyrolysis, which is an oxygen-free burning with the help of microwave technology," he said. The incineration process occurs in a well-balanced burning chamber under low heat temperature (250-300°C) with a controllable and adjustable automatic panel to optimise the temperature so that it achieves the highest ratio of biochar production which is as high as 50 percent. BMC technology offers the best performance as compared to the current alternatives such as open burning and conventional pyrolysis. 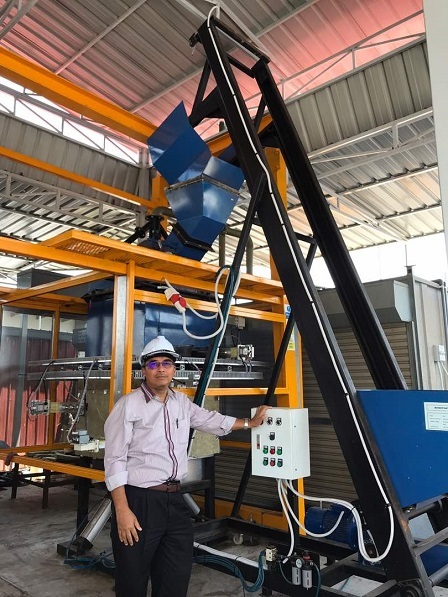 BMC system provides better results in terms of process control, heating time, the quality of bio-charcoal produced, and it is environment friendly with a higher ratio of bio-charcoal produced as compared to open burning and conventional pyrolysis. “Bio-charcoal is a type of green fossil fuel with the ability to reduce greenhouse gasses (GHG) that is usually emitted during the burning of charcoal and biomass in the process of obtaining energy which causes severe air pollution,” he stated. He added that bio-charcoal comes in the form of powder and briquette which can be utilised in various fields including the energy industry, agriculture, cosmetic, water treatment and medicine. As a fuel in the energy industry, he said that bio-charcoal burns 30 percent more efficiently and is 90 percent greener as almost no smoke is emitted during the burning process compared to the conventional charcoal currently available in the market. As for agricultural usage, bio-charcoal has the ability to fertilise and neutralise soil, reducing 20 percent of fertilizer and water usage, as well as increasing growth of between 30 and 70 percent, depending on the types of plants. According to Prof. Dr. Azni, bio-charcoal produced using the BMC system is aimed to be used as a fuel in the energy sector. It is targeted to be used in boiler systems in factories, food service industry such as catering, restaurants and hotels and the retailer sector for barbeque purposes. The target consumers for the usage of bio-charcoal as a plant booster are the farming and the agricultural industries. He said that BMC innovation can give an impact on the socio-economy and increase the income level and livelihood of those in the rural areas as they can sell and supply biomass materials such as empty fruit bunches of oil palm, bamboos, coconut shells, kenaf, wood chips and rice husks.